The human genome didn’t undergo any drastic fat-storing mutations around 1990. But the obesity rate has skyrocketed in the past 20 years, reaching almost 36% in 2010. The problem isn’t our bodies – physiologically, we’re the same as we always were. The problem is the disjunction between the world we evolved to thrive in and the world we actually have to deal with. Evolving in a premodern food environment forced our bodies to adapt to an inconsistent food supply. We’re very good at storing fat, because for most of human history, our next meal was a lot further away than a trip to the Quickie Mart. Fat storage allowed us to stock up on food when it was available, and use those reserves during periods of scarcity. A biologically hardwired taste for fat and sweetness directed us to calorie-dense foods when they were available, maximizing our energy intake to prepare for lean times ahead. Back in the day, these adaptations ensured the survival of the species – without them, we wouldn’t be here at all. Unfortunately for us, our food environment has changed faster than our bodies can keep up. We’re adapted for food scarcity, but confronted with overabundance and the constant struggle to limit our consumption. At the same time, these foods lack in nutrition what they provide in calories, so we gain weight even though we’re also malnourished! Talk about a double whammy! Paleo helps many people lose weight because it re-creates the food environment that we evolved for. Some people accomplish this effortlessly. They cut out the “heart healthy whole grains” and the weight seems to melt off faster than they can buy new jeans. But others struggle with their weight even after the switch – and some people initially see great success but then plateau. Putting so much effort into a healthy diet and regular exercise only to see no results can be incredibly discouraging. But whether you’re just starting and frustrated at your lack of progress, or stuck in a plateau after a few months of success, there are many ways to optimize a Paleo diet for healthy, sustainable weight loss. In this article, you’ll get a look at how weight loss works, why it’s hard, and what you can do about it. To lose weight with a minimum of pain and suffering, it helps to know exactly how weight gain (and loss) works in the first place. There’s a camp fond of (very vociferously) claiming that weight loss is a simple math equation: calories in vs. calories out. Just eat less, and move more, and you’ll be all set: if it doesn’t work, you’re just not cutting calories hard enough. It’s technically true that calories determine weight gain or loss. But in the real world, the way to achieve sustainable, long-term weight loss is not to start cutting or counting calories. First of all, this theory doesn’t distinguish between calories that are nourishing and calories that are harmful. Yes, you’ll lose weight on 1,200 calories of Doritos every day, but you’ll also develop severe digestive problems and micronutrient deficiencies that do much more damage to your health than the weight loss repairs. More importantly, “calories in/calories out” doesn’t account for nutrient partitioning. “Nutrient partitioning” refers to the way calories are used in your body: are they burned for energy, or are they stored as fat? If two people each eat a bagel, and one of them burns the calories to keep her body temperature up while the other stores them as fat, then technically they’ve both proven the laws of “calories in, calories out,” but with very different results! Nutrient partitioning is really where the money is for weight loss. It’s not just about cutting calories down as low as you can bear; it’s about making sure those calories get to the right places. And this leads to the problem of the body fat set point. Everyone’s body has a natural set point for body fat that it “wants” to maintain within a few pounds. If you can stick with calorie restriction long enough to go too far below this set point, your body fights back, using a combination of calorie math and nutrient partitioning. It decreases energy expenditure on everything non-essential (especially fertility: this is why so many women lose their periods if they become dangerously underweight), and makes you starving hungry all the time in a last-ditch effort to get more food. Any extra energy is immediately stored as fat, rather than burned for energy, because as far as the body is concerned, you’re in the middle of a life-threatening famine. It works the same way in reverse, too: gain too much weight, and your body starts burning more and feeling less hungry. But this begs the question: if all these set point mechanisms are so effective, how does anyone ever get fat in the first place? Because body fat isn’t your only set point. You have a body fat “set point.” But Paul Jaminet also hypothesizes that your body has an even more important set point for maintaining the health of your lean tissue. If your body isn’t getting the micronutrients it needs, it will try to get more nutrients using the same mechanisms that it uses when you fall too far below your body fat set point: increasing your appetite and extracting more energy from your food. If you’re eating nutrient-poor processed foods all the time, you’ll just stay hungry, because your body is desperately looking for nutrients by driving you to eat more food. This is called the Food Reward Hypothesis. Basically it goes like this: the foods available in the modern world are more intensely stimulating than anything our brains evolved to deal with. Most people innately find certain tastes and textures (sweetness, saltiness, crunchiness…) pleasurable; this pleasure is called food reward. Highly processed foods overwhelm our brains with a level of food reward that they simply can’t handle, creating a kind of food addiction and throwing our natural taste for healthy foods completely out of balance. 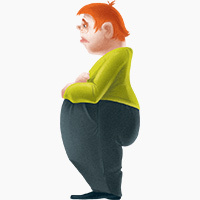 This overwhelms your body’s natural message of “OK, I’ve had enough now,” so you keep eating even though you’re no longer physiologically in need of energy. Remember from above that “nutrient partitioning” means whether a given calorie gets stored for later or burned for fuel. If you store a calorie, then theoretically, it’s available for fuel the next time you need it – like, say, in a few hours when you’ve digested your meal but still need a steady supply of energy from somewhere. Unless you have a precisely monitored IV drip of nutrients attached to your body at all times, you switch back and forth during the day from running off the food you just ate to running off your stored fat reserves. That’s called metabolic flexibility. But now enter a new player: insulin. Insulin is a hormone produced in the pancreas. It’s a storage hormone: it stores energy for you to use later (either as glycogen in your muscles, or just in your fat cells). Insulin is produced in response to eating either protein or carbohydrates (not just carbs! ), and in healthy people it spikes right after a meal to deal with all the energy you just ate and then settles down again to let you run off your stored energy reserves until your next meal. Sometimes, though, insulin stays elevated all the time. This prevents you from running off your stored energy reserves, because you’re constantly in “storage mode” and never switch over to burning those stored calories. In this situation, you’re eating enough calories, but they’re not available for energy, so your body is starving (and you still feel hungry) even though you’re gaining fat. It’s the worst of both worlds. 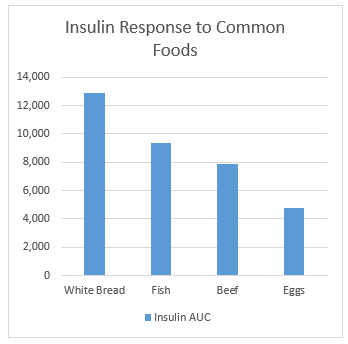 Protein raises insulin just as much as carbs: if bagels are guilty, so is chicken breast! Not everyone who eats a high-carb diet has chronically elevated insulin. All kinds of other things affect insulin levels. Just to name a few: sleep deprivation, chronic stress, exposure to environmental toxins, menopause, genetic factors, vitamin deficiencies, and the composition of your gut flora. It’s true that eating more carbs than your body can handle is one factor affecting insulin levels, but it’s far from the only problem! There’s no one demon nutrient to blame for insulin trouble, and the causes probably vary from person to person. Regardless of how it starts, though, chronically high insulin can overwhelm the body’s “set point” and cause weight gain. Problems with insulin also affect another hormone called leptin, which regulates appetite and metabolism. The ultimate result is that your body is now “defending” a higher weight, making it very difficult to get (or stay) lean. If you want to lose weight like this, you’ll have to eat an astonishingly tiny amount of food, and you’ll constantly be hungry and cranky – realistically, it’s almost impossible. All of these problems – nutrient insufficiency, food reward, and nutrient partitioning – explain why the advice to “just eat less and move more” doesn’t really work. Eating less can actually make a nutrient deficiency worse, not better. And it certainly doesn’t address the problem of hyperpalatable foods or hormonal dysregulation at all! This is crucial. Weight loss is not about willpower. Diets based on willpower fail. You cannot lose weight by fighting your body. You might win the battle, but your body will always win the war. You can only lose weight by removing the need to fight your body. That’s why the Paleo approach to weight loss is different. Instead of just trying to starve your body into submission, the goal is to fix the underlying problems. It’s about working with your body, not working against it. If you’re eating a solid Paleo diet, you’re eating an amazing variety of nutrient-dense foods, from superstar animal foods like liver and seafood to plant foods like avocados, not to mention the big pile of vegetables at every meal. For most people, Paleo is much more nutritious than anything they were eating previously. In some cases, a supplement might help, but generally speaking, Paleo has you covered for nutrition without really paying much attention to individual vitamins and minerals. This will eliminate any cravings based on nutrient deficiencies, which takes away one huge reason for your body to fight your weight-loss efforts. Another reason why your body might be fighting you is the “confusion” caused by high-reward foods. Again, you can fix this with Paleo. If you’re hungry, Paleo food is delicious. But if you’re not hungry, then it’s not very “more-ish:” it’s not like a bag of chips, where you can just keep reaching into the bag again and again without ever realizing what you’re doing. Try to eat a plate of broccoli or scrambled eggs that way, and it just doesn’t work out. This almost automatically takes out the problem of “hyperpalatable” or overstimulating foods. There’s nothing in a typical Paleo diet that shouts down your body’s hunger and satiety messages like that, so there’s no need to try to use “willpower” or anything else to eat absurdly tiny portions of foods deliberately designed to be addictive. Even though these foods are technically “Paleo,” some people find them hard to stop eating; going cold-turkey often helps, at least until you get into better eating routines and habits. It’s also worth noting that food gets much more rewarding if the rest of your life is not rewarding. Boredom and misery make it easy to look to sugar for comfort. Improve the rest of your life, and food will have a much smaller hold over you. First, find a carb level that works for you. When it comes to weight loss, carbs are complicated. If insulin is a fat storage hormone and carbs raise insulin, you’d think that completely avoiding all forms of starch and shooting for ketosis would be the fast track to metabolic healing. For some people, it works that way. But on the other hand, not everyone does well with low-carb; some people actually lose weight faster with a moderate-carb diet. You can read all about this in detail here; the short version is: Paleo works because it lets you find the carb level that fits your own body, not because it prescribes one carb intake that everyone has to follow. Avoid extreme and punishing exercise, and make sure you recover properly from your workouts. Limit nuts and seeds, and eat plenty of fish (for the science geeks in the audience, this improves Omega-6 to Omega-3 ratios). A third strategy is intermittent fasting. Intermittent fasting mimics the benefits of carbohydrate restriction: for example, it lowers insulin, prompting your metabolism to use stored body fat for fuel. Since you aren’t taking in any calories during a fast, your body runs entirely on the stored fat. As icing on the fat-burning cake, fasting also raises the levels of several other fat-burning hormones like growth hormone and adrenalin. Like a standard Paleo diet, intermittent fasting also lowers your calorie intake without forcing you to think about calories: you might eat a slightly larger meal to break your fast, but if you fast for 24 hours you’re hardly likely to eat an entire extra day’s worth of food at the end. A word of caution, though: fasting isn’t for everyone, and there’s no requirement to do it if it doesn’t work with your body. Finally, you can improve nutrient partitioning through that most old-fashioned of weight reducers: exercise. Exercise is not good for fat loss because it “burns calories.” It works because exercise improves the hormonal environment in your body, making it more conducive to good nutrient partitioning (burning calories for fuel instead of storing them as fat). It doesn’t have to be extreme, either. Just walking is fine. Take the dog to the park, ride your bike to the grocery store, or park a mile away and walk to the office. No extreme burpee-studded hill sprints required. If your body is storing all your calories for fat instead of using them for fuel, dropping down to absurdly low calorie levels isn’t going to work. But once you’ve taken care of everything above – the micronutrient needs, the food reward factor, the nutrient partitioning – then it’s time to talk about calories. For most people, the answer is simple: Paleo automatically lowers your calories without you ever having to think about it. When you replace a pile of bread with a pile of broccoli, you’re dramatically reducing calories. The same goes for replacing Coke with water, or any of the other changes people typically make when they go Paleo. Eat lots of vegetables with every meal. Limit nuts, nut butters, dried fruit, and fruit juice. Avoid Paleo “treats” made from nut flours. Limit alcohol and other liquid calories. Avoid shakes, smoothies, and juices. This will create a more or less automatic calorie restriction without you having to spend ages logging every bite you take, or worrying about whether or not you can “afford” another snack. Permission to tear up your food log: granted. Successful weight loss isn’t about counting calories in your low-carb tortillas, or “earning” every indulgence with an hour of sweating it out on the treadmill. Trying to starve your body into submission without addressing your underlying metabolic problems and nutritional needs is ineffective and unnecessarily painful. The key to lasting weight loss is to work with your body, not against it, and address the underlying problem behind the weight gain. Then the weight should come off more or less painlessly, with a minimum of deliberate restriction and a maximum of delicious meals!